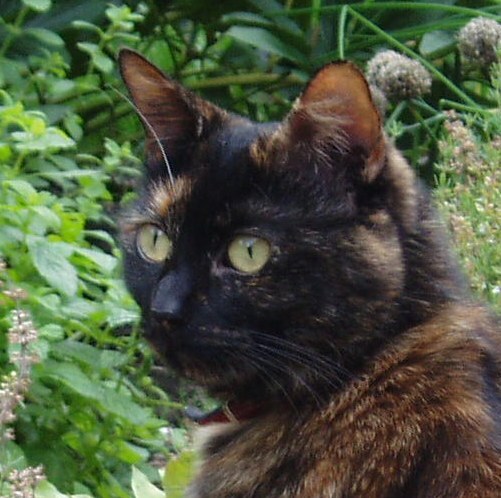 This weekend I’ve been busy moving, with help from my husband and my good friend Jette. 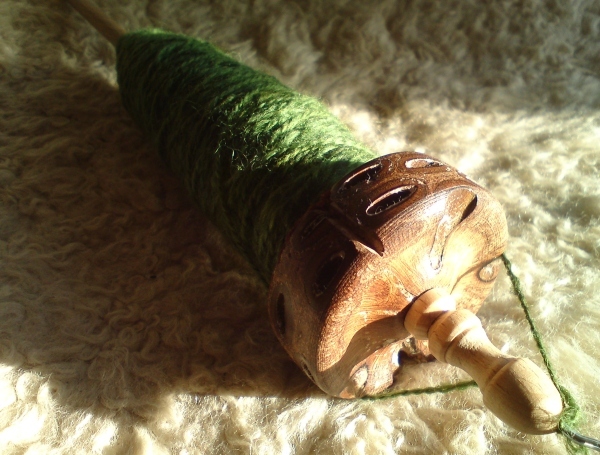 In the beginning of this year I had to close down my beloved yarn shop after 10 wonderful years as a shop-owner. 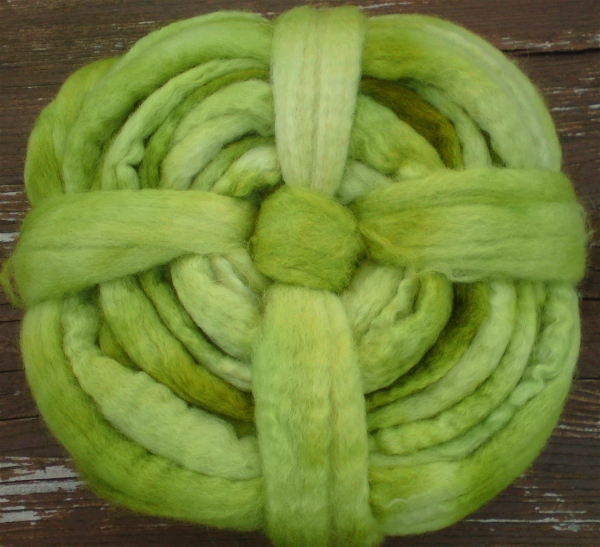 Shortly thereafter I decided to carry on in the fiber business, almost as usual, just without a physical shop, and with main focus on fibers, dyeing, spinning and handmade items instead of factory-produced knitting yarns. Last week I the finally found the right place for my new working life! 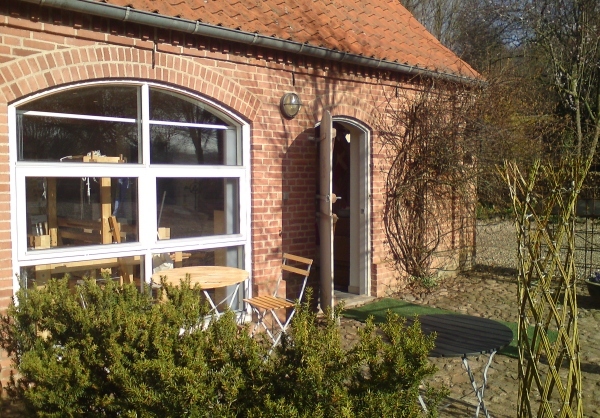 Out in the countryside close to the forest, in a place that has a watermill that dates back to the 17th century. 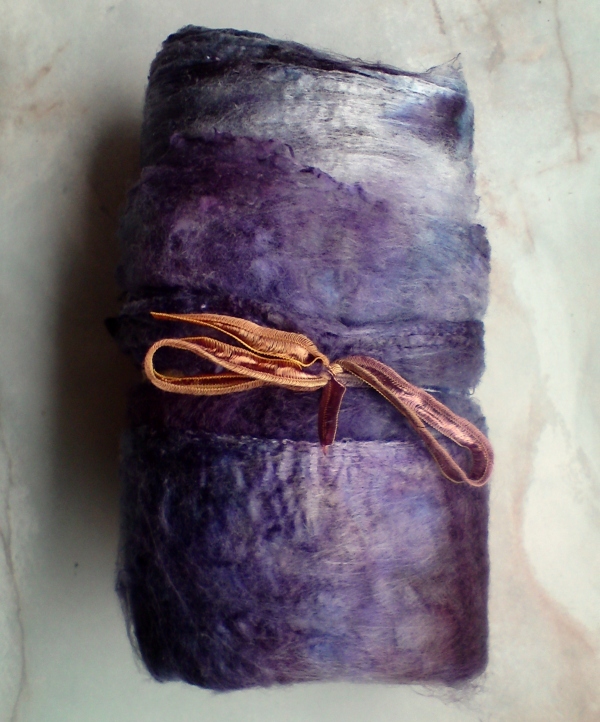 The mill has not been working for maybe about a 100 years (hasn’t had a wheel for ages) but in the old times it was actually used for dyeing cloth I have been told. That’s pretty cool.. The waterfall comes down where the big mill wheel used to turn. 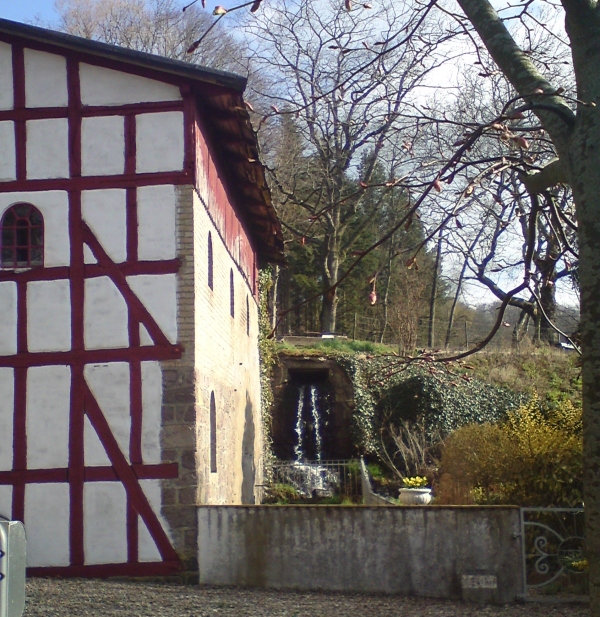 The owners of the place have a dream about setting up a new millwheel and renovating the mill house, but that’s very expensive, they told me. Anyway, I find it very charming as it is! Through the window you can see my loom, set up yesterday with help from my husband. Can’t wait to get to work! But there’s still a lot of unpacking and sorting out to be done first. Lots and lots of boxes full of yarn, wool, garments, books, knitting/weaving/spinning equipment and … stuff has been moved, and I still haven’t moved any of the dyeing gear. 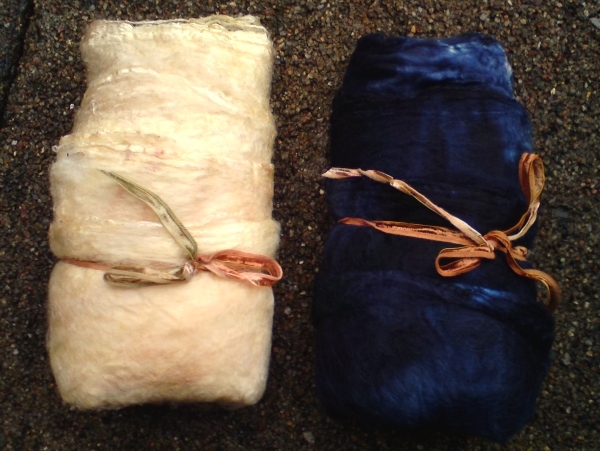 The red fibers (both the “wheels” and the silk hankies) I dyed earlier this week. 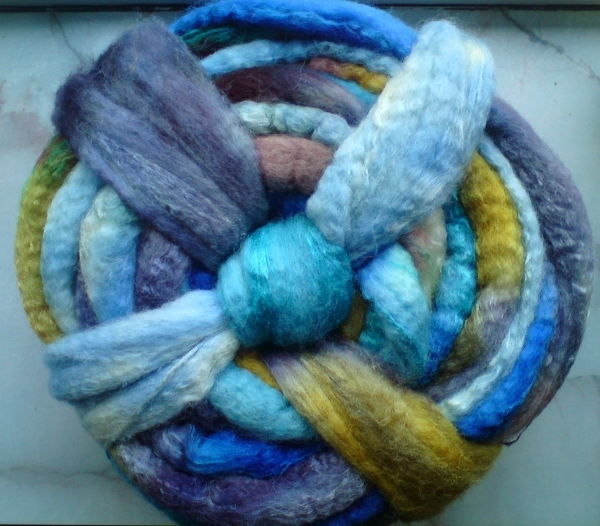 Colorway “Rose Petal”. 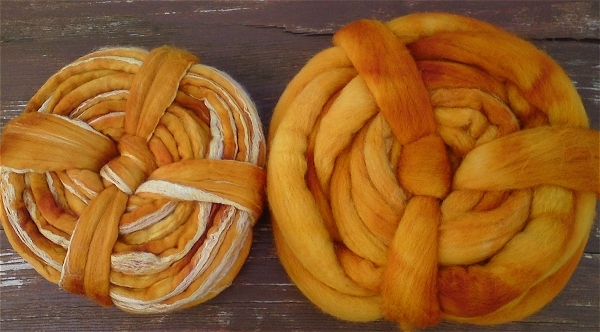 You are looking at the colorway “Turmeric” (“Gurkemeje” in Danish). 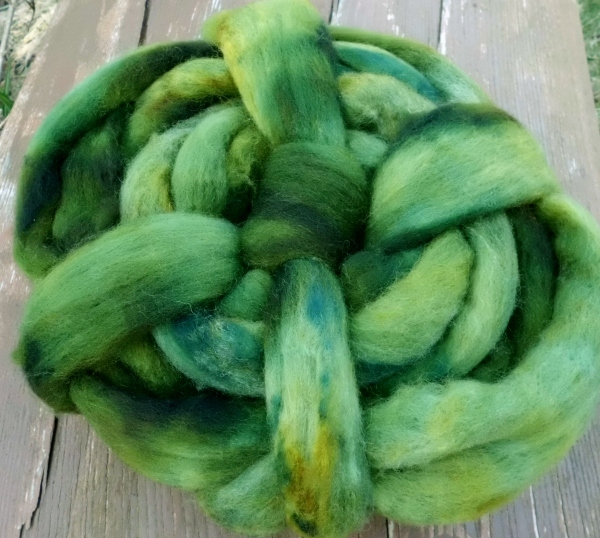 This color is one in a series of monochromatics or semi-solids that I’m working on right now. I have 6 coloursways ready by now which can be seen on the page of that very same name – see menu on top. 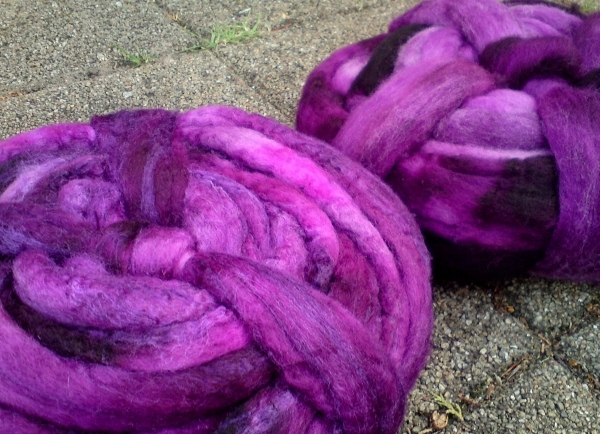 Another new one is “Dark Fuchsia”. 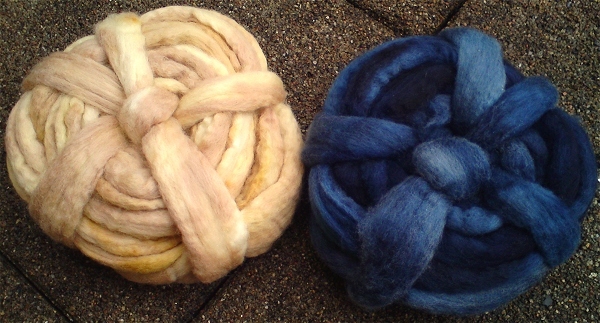 I hand-paint these colorways on first quality wool top from various breeds or on luxury blends like wool/kidmohair, wool/silk, wool/bamboo and several other combinations. 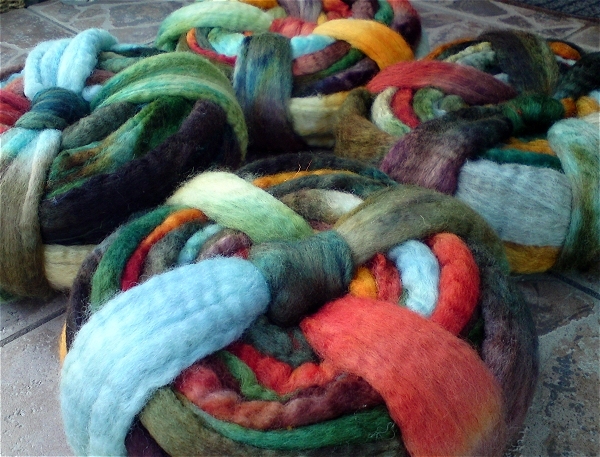 The hand painted “wheels” are great for spinning and felting. If you would like to try one out please go to my website (no real web-shop yet, I’m afraid, but I’m working on that..) and check the in-stock list. You can also email me with your request. I accept PayPal or bank transfers. 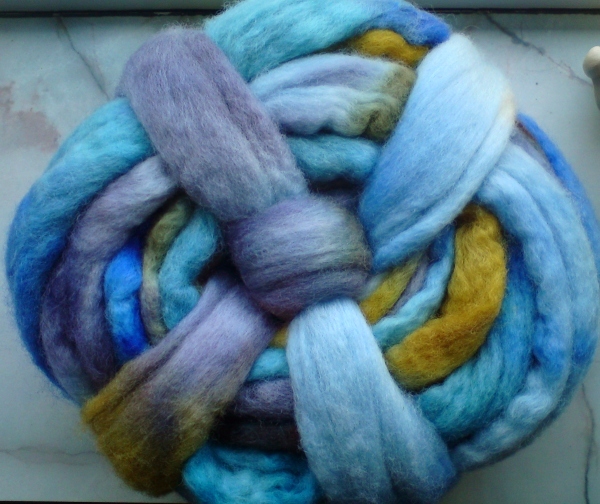 Drying outside right now in the (rather chill) spring weather hangs one of my older colorways, a multi-colored named “Gypsy”. 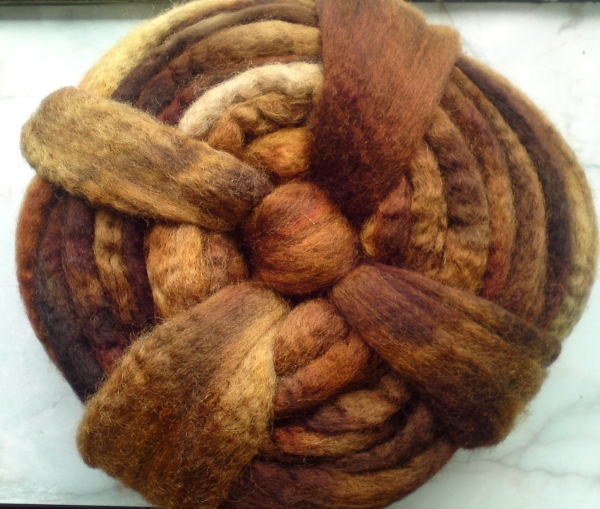 There’s a little bit of this one reserved for my own spinning pleasure – can’t wait untill it’s dry!